[prMac.com] Revere, Massachusetts - Indie developer James Hollender's version 2.1 of his iNutrients app contains the latest USDA National Nutrient Database (SR-26), which requires no Internet access, for 10 nutrients: Calories, Carbohydrates, Dietary Cholesterol, Fiber, Potassium, Proteins, Saturated Fat, Sodium, Sugars and Vitamin K, is now on sale with 25% off thru Labor Day, September 1st, 2014. The database now includes 8,463 different foods and 15,135 food servings. Despite the enormous number of foods and food servings in the USDA National Nutrient Database, there are still many which aren't included, especially most name brands. Having the capability of defining Custom Foods that are missing fills this gap, which then makes keeping track of daily nutritional intake more complete. It's extremely slick to be able to input the information from a packaged food's nutrition label and moments later see color codings for all ten nutrients indicating the ranking of their concentration. As an example the developer talks about a popular brand name frozen dinner. Once the data from the nutrition label is input and saved, the color rankings show up for the Custom Food indicating Carbohydrates are Extremely High (Black); Sodium is Very High (Dark Red); Calories are High (Red); Potassium, Saturated Fat & Sugars are Moderately High (Orange); Proteins are Moderate (Yellow); Cholesterol & Fiber are Moderately Low (Light Green); and Vitamin K is Unknown (Gray) because data wasn't available. This immediately points out that maybe this small meal, eaten frequently, isn't as nutritionally good as originally thought. If for some reason the user doesn't agree with the developer's default Color Scales for the ten nutrients covered, each individual scale can be customized. Making a change will be reflected for all previously recorded data when next presented. * Potassium - Helps with anxiety and stress; blood pressure; brain function; cramps, etc. * Sodium - Would you believe there's sodium in water? For the price of 2 individual nutrient apps, users can get all 10 nutrients in a single app. iNutrients utilizes information taken from 100% of the USDA National Nutrient Database for each of these ten nutrients, unlike the individual apps which only cover less than 10% of what's available. Users will find the Search functionality lightning fast as all needed infromation from the USDA database is local to the app - no internet connectivity is required. * Delete - Delete the current Food Serving. * Change Number of Servings - Change the number of Servings for the current Food Intake Item. * Change the Intake Date - Move the current Food Serving to another day. - This is extremely useful if the user wasn't able to enter what they've eaten on the day it occurred; just simply enter it and then use this function to change to the date needed. * Copy the Intake Item to Today - This allows the user to copy an individual Food Intake Item from any day, making a copy for the current day. 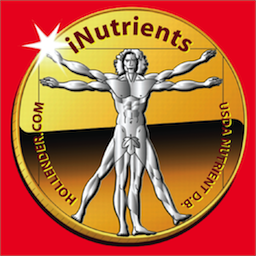 iNutrients 1.2 is normally $3.99 (USD), but is on sale for $2.99 thru Labor Day, 09/01/2014 and available worldwide exclusively through the iTunes App Store in the Health & Fitness and Medical categories. Review copies are available on request to qualified organizations. Based in Revere, Massachusetts, Indie developer James Hollender is a well seasoned Information Technology professional who has been familiar with Apple products since the days of the first Macintosh computer and has been involved with object oriented programming since the introduction of Java, culminating most recently in writing apps in Objective C for the iPhone, iPod touch and iPad. His innovative ideas have resulted in numerous suggestions and other awards including a commendation from The President of the United States. James Hollender has been involved writing iPad apps with Foliage, Kronos, Olympus, Agero and now Valmarc. Copyright (C) 2010-2014 James Hollender. All Rights Reserved. Apple, the Apple logo, iPhone, and iPod are registered trademarks of Apple Inc. in the U.S. and/or other countries. Other trademarks and registered trademarks may be the property of their respective owners.